This book is a powerful refutation of the charge of Replacement Theology as well as utterly destroying the Israel Only view! The Israel Only crowd continues to self-destruct. Whereas it has been one of the leading claims among them that God only loved Israel, and no other nation – appeal being made to Amos 3:1-3 – in December of 2018 – when this point has been pressed, some IO proponents have admitted that this is not true! One such IO even denied that IO says that God does not love anyone today. When I have asked for him to identify who God loves today, how He manifests that love, there has been nothing. No answer. Not a keystroke. To say that God does love some people, some nations, some individuals today – other than Israel – is to surrender the IO position. To set the stage here, keep in mind what I have just noted, and it is confirmed by Corey Schultz on FaceBook on 12-18-18, and that is that the “nations” were only the descendants of Abraham, and only those descendants were ever saved. They were all saved in AD 70, and since then, no one has been or ever will be saved. I should point out that Jason DeCosta, caustic, arrogant IO advocate on YouTube, has stated repeatedly, contra some other IO,ers, that in fact, foreigners, pagan, non-Israelite foreigners, could always join with Israel and become a part of the covenant people. This is stunning- and fatal. Has the IO community admitted from time to time that Israel was among the nations? Yes. That is not the point. The point is that they have vehemently claimed, on numerous forums, that Israel became the nations and the nations became Israel to such an extent that when we read of the salvation of the nations, it is speaking exclusively of the salvation of Israel. There is no place in the IO paradigm for the salvation of any non-Israelite nation- period. But, the admission by Beiras and Bradley is a fatal admission. It literally gives the farm away, on a golden platter. Now, let me drive this point home as I continue responding to the critics: If, in Hosea 8 and 9, Israel was among the nations and was not therefore the nations, then if it can be shown that at any point after Hosea both Israel and the nations would be saved, this is fatal to the IO paradigm. You cannot admit that Israel was among the nations and at the same time claim that Israel was the nations. You may show that Israel was so dispersed among the nations to such an extent that to call the nations was in effect to call Israel, but that is a far cry from equating the nations with Israel and vice versa. So, as I posted on FaceBook, when IO makes their admission that Israel was among the nations, thus proving that the nations were not Israel at that time in history at least, this is truly fatal. For their view to have even an iota of merit, they must prove that at some point of time subsequent to Hosea, Israel was in fact to be totally identified as the nations and, the nations are to be wholly identified as Israel. They have not proven this, and they cannot prove this. The fact is that in Hosea’s time, while Israel was clearly not the nations, and the nations were not Israel, we have an eschatological promise of the salvation of the nations. That would be the nations “among” whom Israel was scattered. That is non-Israelite nations. Gentile nations. Now it shall come to pass in the latter days That the mountain of the Lord’s house Shall be established on the top of the mountains, And shall be exalted above the hills; And all nations shall flow to it. Many people shall come and say, “Come, and let us go up to the mountain of the Lord, To the house of the God of Jacob; He will teach us His ways, And we shall walk in His paths.” For out of Zion shall go forth the law, And the word of the Lord from Jerusalem. He shall judge between the nations, And rebuke many people; They shall beat their swords into plowshares, And their spears into pruning hooks; Nation shall not lift up sword against nation, Neither shall they learn war anymore. Now, you must understand that at the very time Isaiah wrote this, Hosea describes Israel as “among the nations”– they were not the nations, as IO admits. And yet, Isaiah, the contemporary of Hosea, foretold the time when “all nations” would flow into the house of the Lord. Not some nations. Not “twelve nations” but all nations. And, to drive home the point of the IO admission, Israel was among the nations at this very point, and was not those “all nations” that Isaiah speaks of. To anticipate an IO response, I can imagine someone claiming that while Israel was not the nations in the time of Hosea and Isaiah, nonetheless, in the last days, the time under consideration in Isaiah, Israel had become the nations and the nations were to be identified as Israel. But that is a specious and desperate argument and it denies, history, Jewish belief and most of all scriptures. It is worth while to ask, Did the Jews, did Israel, at any time, consider themselves (The Diaspora) to be “the nations” the “Gentiles,” or “pagans”? I must be honest here, such a suggestion is so far beyond the reality of Jewish / Israelite belief as to be even considered as remotely valid. It is, to be blunt, utter nonsense. Now, should an IO advocate claim that while Israel was not the nations in Hosea, by the time of Christ, they had become the nations, the entire burden of proof lies on IO to show when and where that definitive line of demarcation came into a reality. You cannot just make a claim. It must be proven, and I have challenged the IO community to show with scriptures – when and where that transformation took place. I have not received a single attempt at Biblical proof – not a keystroke. Don K. Preston //Bradley Parkinson I don’t believe that is valid. But, even to grant your argument, it still demands that after a given point of time– when ever that was– that Israel was the nations and that the nations were Israel. I am asking for that time- supported by scripture. Parkinson responded – The time would be when the context is those under the Law that were also referred to as the nations or Gentiles. Demanding an actual date is a strawman. It is not required for IO to be valid. You’re the only one who would be requiring it in order to believe IO, showing that no IO needs this to be true to see it as valid, hence a strawman. These are not exclusionary ideas. These people were once definitively Israelites with “The nations” being out there. After their exiles, naturally they became blended with “The nations”, becoming a part of them. Their ancestry did not change, but those alive when they are referenced are indeed changed and totally blended with “the nations”. The dates you seek are when it is finally mentioned, given the context that those spoken to have this requirement of being under the Law. I hope this makes sense in addressing this requirement of yours that a date must be given for when this happened. Josephus confirms this, noting that even in the first century the ten tribes were not lost but were among the Babylonians and other countries. Second, your claim that “the time is when it is finally mentioned, given the context of those spoken to.” Well, show us the time at which the nations are Israel and Israel is the nations. That is the issue. Show us where “all the nations” were under the law, and thus, of necessity, are to be identified as Israel. Show us where Babylon for instance, was Israel – under the Law. Show us where Rome was Israel- under the Law. Show us where Parthia was Israel, under the Law. Your claim cannot be established since Paul said the Gentiles (ethne) did not have (they did not possess) the Law. It does not say that they did not observe the law. No, they did not have the Law. Thus, per your own criteria, they were not Israel. I would note that in the critical text of Romans 11, the Gentiles are clearly not Israel and Israel is patently not the nations. The Gentiles were boasting against Israel – not against themselves. The Gentiles were not of the Root, Israel was. The Gentiles, by faith, could be grafted into the Root “with” Israel, not AS Israel. Israel had been cut off from the Root, The Gentiles had never been part of the Root. These Gentiles, remember, are the ones that did not have the Law, thus, they could not be Israel. IO is defeated. You have not shown that the Israelites became the nations. (I am not denying by any means that the Israelites inter-married, and that is significant). But, since it can be shown that there is an unbroken chronological record of references to Israel “among the nations” from Hosea onward, even in the NT — proving a clear-cut distinction between Israel and the nations, then your claim is moot. The burden of proof lies fully and squarely on IO to show where Israel became the nations and the nations became Israel, and yet, both you and others are openly admitting that Israel was among the nations. Parkinson said: So, once again, even if there was a “transitional” period, then there had to be (logically) a point of time at which the nations were then considered Israel and vice versa. It is sort of like, when was a wolf not a dog and then when was it? At some point it wasn’t a wolf anymore. But when that was is irrelevant, as we can get approximations from when someone first wrote “this animal is a dog”. Response: Wrong and illogical. Determining the point of change of identification becomes the entire point – especially in the IO paradigm. If a point came at which the wolf was no longer a dog, (or vice versa) then from that point onward, it is inappropriate and wrong to call it a dog. Thus, in the IO paradigm, it is absolutely critical to show, for instance, that when the Lord spoke of the calling of the nations, that IO be able to prove that the “DOG” was no longer a DOG, but a wolf. What is your proof that Israel became the nations and the nations became Israel? Where do we find Israel no longer called Israel? Where do we find the nations no longer identified as the nations, but as Israel? Your claim is evasive, diversionary and false. It is, in reality, self-defeating, because you cannot provide the clear-cut evidence of when the dog became a wolf or vice versa. Let’s not forget that IO claims that the nations are Israel and Israel is the nations. Thus, the entire burden of proof lies on IO to show when and where that definitive line of demarcation came into a reality. I have not received a single attempt at Biblical proof. Parkinson then said: The claim is that Israel is “part of” the nation’s, not “the nations”. They were genetically blended and blended through the adoption of customs, thus identifiable as a Jew or someone who was a descendant of Abraham. These people were just a small part of the nations, and that is how it should be seen. Response: That is false. IO most assuredly does not identify Israel as “part” of the nations, or, there would be far less controversy about whether the nations could be saved. Remember, IO claims that Only Israel was saved– right? Of course that is right, or it would not be called Israel Only. IO does not say or admit that the nations “among” whom Israel was scattered were saved, that is emphatically denied. (DKP– Corey Schultz, in a post on 12-17-18 verified this view as the true IO position). You seem to be changing the game in mid-stream. God did not simply say that He would save Israel “out from the nations.” He said that He would save the nations. Or, are you going to claim that the nations – not just Israel– were saved? And, are you going to say that “the nations” not just Israel, can be saved since AD 70? However, if one shows that from that time onward, Israel was still “among the nations” at all times, then this shows that Israel never was the nations– she was always among them– John 7:35– Game over. At this juncture, let me develop John 7:35 a bit more so that the reader can catch the full power of it. Now, keep in mind that in Hosea’s day, Israel was among the nations. She was not the nations. Remember from Josephus, cited just above, that the Jews understood that the ten tribes, the Diaspora, were “among the nations” meaning that just as in Hosea, the ten tribes were not the nations. So from Hosea to John, the testimony is consistent, Israel was among the Gentiles, she was not the nations. That is an unbroken chronological narrative. Here, Luke records the Lord’s words to Ananias about Paul’s mission. Paul was to go to Gentiles, to kings and to the children of Israel. The Gentiles are patently NOT the children of Israel. This confirms our points in Romans 11 where Israel was not the Gentiles and the Gentiles were not Israel. Then the Jews said among themselves, “Where does He intend to go that we shall not find Him? Does He intend to go to the Dispersion among the Greeks and teach the Greeks? Carefully observe that the Jews– who knew more about who Jews, Gentiles, Greeks and Israel were than any IO advocate today – pondered Jesus’ words. They asked if he would go “to the Dispersion” (Greek, Διασπορὰν, Diasporan, Strong’s #1290). We need to understand who was asking this question. It was the Jews. It was – if one wanted to make the argument – members of the two southern tribes. The fact is, they were not the Gentiles, they were not the Greeks, and, they were not the Dispersion. Who were the Dispersion? They were the Ten Northern Tribes. According to IO, they were the Gentiles, they were “the nations.” (I have been challenging the IO adherents to prove that the Gentiles were in fact the ten tribes, but so far, I have received no evidence. Since this is the foundation of their entire view, one would think that it would be easily demonstrated, but, the evidence is not forthcoming. All I have gotten is just bold, unproven, undocumented claims. The fact is that in John 7, neither the Jews or Jesus, understood the Diaspora to be the Greeks. That means that they did not identify them as the Gentiles either. That audience said that the Dispersion was “among the Greeks.” They did not say that Israel was the Greeks like the IO proponents claim. They did not say that the Greeks were the Dispersion- as the IO advocates claim. (One IO proponent actually argued on FaceBook that the Greeks were in fact the Diaspora, non-Torah observant Israelites. They gave no proof, because there is no proof for such a claim. This illustrates blatant dishonesty in dealing with the text). The Jews said (just as Hosea 8:8 shows) that Israel was among the Greeks, among the nations. They were “wanderers among the nations” (Hosea 9:17). What is said in John 7 agrees with Acts 9:15, (and Romans 11 where the Gentiles are not Israel). There is a sharp, clear and undeniable distinction between Israel and the nations, between the Dispersion and the Greeks. They are not the same, and any and all attempts to say otherwise is nothing but a perversion of the texts. In John 7 the word for Greek is eλλήνων Hellēnōn, Strong’s #1672). In Romans 1:16 it is λληνι, Hellēni, Strong’s #1672). I had one individual try to convince me that these words refer to a Hellenist, not to an ethnic Greek. He claimed that I was wrong to claim that the Greeks were ethnic Greeks in John and Romans. But, his claim is off base. The word for a Hellenist, someone, or anyone – including Jews – of any ethnicity that adopted the Grecian language and customs, is not the word used by the Jews in John or by Paul in Romans. The word for a Hellenist (one who had adopted Grecian ways) was hellenistees, and cognates, as so used n Acts 6:1, where the word λληνιστον, Hellēnistōn, Strong’s #1675) is used. There is a distinct difference between a Hellenist and a Greek. Remember that in John 7, the Diaspora (the Northern tribes) were not the Greeks. Now, in Romans 1:16, the Jews are not the Greeks. Thus, neither the ten tribes or Judah were the Greeks. And yet, Paul said that, “the Gospel is the power of God to salvation for everyone who believes, to the Jew first and also the Greek.” The Gospel is for the Jews, and the Diaspora (see 1 Peter), and for the Greeks, indeed, for all men, anyone and everyone that believes – Jew, Israel, Greek and Gentiles. This is Acts 10:34-35, and we will examine that text and some others in our next installment, so stay tuned as we continue Responding to the Critics. 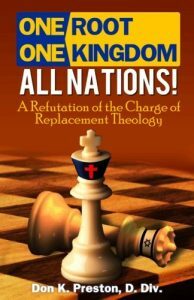 Be sure to get a copy of my book One Root, One People, One Kingdom, for even more- irrefutable proof that God always planned to include all men, of any nation, into the Kingdom of Heaven.